Today is April 9th, 2018. Last week, Tiffany and I conducted an un-scientific test to find out how easily we could live off-grid(ish) with our Goal Zero Yeti 1400 Lithium Battery System, our Yeti 400 Battery System, and our Goal Zero Boulder 200 Solar Briefcase and our Goal Zero Boulder 100 Briefcase. If you haven’t seen our Youtube video detailing the process and our experiences, go ahead and check it out below. Its ok, I’ll wait. /sarcastic blogger. If you’re coming from Youtube and want to see more specifics, you’ve followed our breadcrumb trail of links correctly. Congrats! As stated above, this was not a scientific test. The real purpose of the test was to get an idea of how our power hungry devices will fair on a minimal solar setup. After we saw how our main and most important devices use power over the course of a normal work day, we could make informed decisions about other less power hungry devices like LED lighting, battery powered lights, and Wifi/LTE boosters. We did not live in the bus during these 5 days since the bus doesn’t have a bed or running water yet, so we stayed in the house. That being the case, we did not include a water pump, lighting, or our wireless setup during this test. We did our best to replicate a normal workday and tried not to conserve too much electricity so we could get a good idea of what normal life would be like living with this solar setup. Our configuration included the Boulder 200W briefcase being dedicated to the Yeti 1400 Lithium, and the Boulder 100W briefcase dedicated to the Yeti 400.
sunny in the morning and late afternoon. Cloudy most of day. 1400 had discharged to 89% overnight (recorded at 7:00am.) By 8:35am it was already up to 97%. Fan will turn on occasionally due to the MPPT unit heating up- lots of power coming in. Tested yeti 400 with epson artisan 1430 printer. Handled no problem. Printed 4 8×10 pages and 3 shipping labels. Peak wattage pull was ~30W. Very little drain. 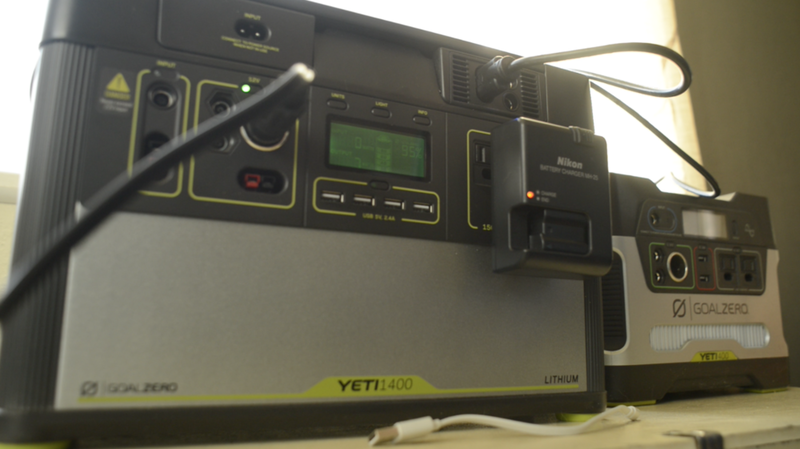 Charged both computers at same time on yeti 400- pulling 150W continuously. Did O.K. but was probably a little hard on it. Made some noise. 150W is 50% of maximum surge so sustained charging at that rate is inadvisable. cloudy in the morning, only pulling ~30W vs yesterday at the same time pulling 130W. Went to bed at 1am night before. 1400@ 100%. This morning woke up at 7am to find battery had only dropped to 1% but had successfully powered the Dometic fridge all night. Computers can be charged while in sleep mode and pull almost 50% less power than being charged while in active use. Input light on main body (not MPPT) will come on only when sufficient power is being pulled from the panels. 2W is not enough to charge, but 4W is. Could not get any charge early in the morning, but as clouds thinned more wattage came in (up to ~33W but stayed around 15W for the most part). Charged lap tops, nikon batteries, and phones. The 5 day test was a success. Of course 5 days is not a long enough time to truly tell if we’ll be able to live perpetually off of our current Solar setup, but we did get an idea of what life might be like, and we’re encouraged by the results. We found that the Dometic fridge is a lean, mean, power sipping machine. Its highest power draw from the 1400 was ~36W while the compressor was on. The compressor typically came on once per hour and only lasted 1-2 minutes. The rest of the time the Dometic would draw next to nothing (not even reading 1 watt draw from Yeti). Easily the most power hungry of our devices, our computers pulled the greatest amount of power from our battery banks at any given time. However, we did notice that we could manage their draw. While in use and with both batteries charging they would pull a combined 150W from the battery bank, which was a bit too much for our Yeti 400 at the same time but our 1400 handles them both no problem. After the computers were at 100%, we left them plugged into the Yeti 1400 to see how significantly the draw changed. The computers would draw ~50% less power while their batteries were full. While the computers were sleeping, they would pull even less power, even if their batteries were not at 100%. This got us thinking that on cloudy days, instead of using the computers while charging them, we could use them unplugged and then once we needed a charge we could put them to sleep and charge them. Our other devices required smaller power draws and did not take long to charge. While certainly not negligible, their power requirements were more manageable and required less strain on the electrical system. Our lowest battery level was the last day at 58% after a full day of overcast skies with rain and snow. The next day we extended the test a bit and charged the system off of solar one last time. The following day was very sunny and allowed the battery bank to very quickly come back to 100%. Our highest input off of the 200W panel was 185W. On a sunny day with no cloud cover we could easily sustain 150W of input and had energy to spare. Obviously sunny days brought in the most power, often making more energy than we were using at any given time (even when charging both laptops and fridge at the same time). On cloudy days we still brought in power from the sun, although nowhere near as much. While we used more electricity than we generated during cloudy days, the small amount of energy still being brought in from the sun helped the batteries last longer. Judging from this test, we would have to have sustained cloudy skies for several days (which is definitely possible) to completely run out of energy. Knowing this, I think we could add another 100W at least of solar to really help mitigate the cloudy days and pull more from less. We’re excited to test the system further and with more devices. We’ll probably end up with a gas generator in case of emergency or if we get stuck with clouds days on-end, but I doubt we’ll need to use it too often, especially in the sunny American West.